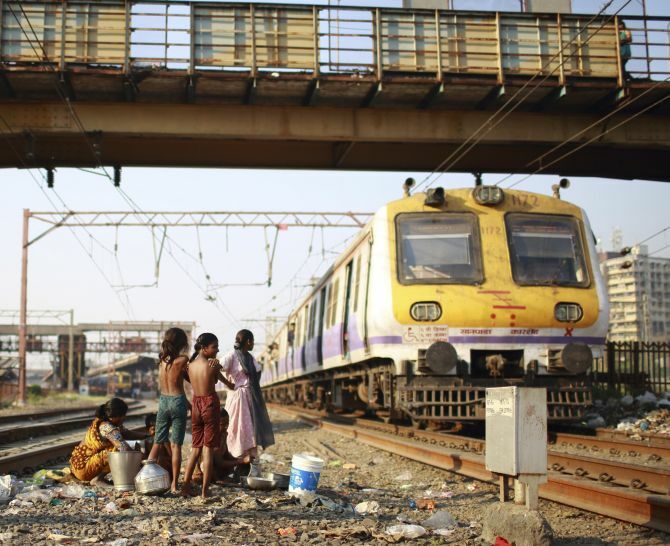 Rediff.com » News » Will Railways' ChildLine scheme make runaway children safer? Will Railways' ChildLine scheme make runaway children safer? Are the ChildLine booths for runaway children an attempt to sanitise Indian railway stations or a genuine effort for the protection of 'railway kids'? Officials from both the women and child development ministry and the railway ministry stridently deny the accusation that the installation of ChildLine booths, an initiative launched at the end of November, will be used to 'clean up' railway stations from runaway children. Trains are the most favoured means of transport for children who run away from violent, abusive parents or else while being trafficked into slavery by gangs. But it is one thing to attempt to make the railways safer for children, but quite another matter to put these kids under one umbrella and allow the railway staff to herd them into ChildLine booths from where they are sent back to their homes or else pushed into institutions where they can be subjected to even more neglect and abuse. Khusboo Jain, a sociologist and research scholar at the Delhi School of Economics, had sought the Delhi high court's intervention on improving the lot these 'railway kids' as some activists have nicknamed them. Jain admits to being appalled at the latest intervention by these ministries through which ChildLine booths will be created at railway stations across the country. The women and child development ministry will also post child protection posters and have created a helpline number 1098 as part of its efforts to rescue these kids. NGOs believe that at any given time there are over 100,000 children living in and around railway stations, many of whom spend their time travelling between stations. "While runaways comprise 10 per cent of this lot of children, many of these kids are rag pickers earning money from the waste generated in these stations or even others who merely loiter about," says Jain. "I had petitioned the court to make the railway space safer for kids, but these ministries have gone ahead and created these standard operating procedures for rescue and relocation as though that will solve this problem," she adds. Jain is also surprised that neither of these ministries has bothered to acknowledge or use the existing models which presently take care of these itinerant children. The most well known of these projects is Muktangan which was started at Malda station in West Bengal by the NGO Prajaak in 2001. Muktangan, meaning open courtyard, has attempted to work closely with Eastern Railways officials and personnel and has come to be popularly known as the RPF-Muktangan. The brainchild of activist Deep Purokayastha, it works on a two-fold basis. The first step has been to sensitise railway personnel to the problems and psychology of this young population. The second step has been to involve citizens groups to act as partners and to monitor this project. Muktangan allowed children to live in these shelters and work out of these spaces. Many of them were also provided an opportunity to learn a skill during the time they spent there. Most chldren spent time there till they found gainful employment after which they moved on. The success of Muktangan can be gauged from the fact that crime against passengers by children in the Malda station precincts fell by 35 per cent in one year of its launch. The concept was then extended to seven other railway junctions. Prajaak also launched a survey of these 'railway kids' on the Eastern Railways which was designed by the Indian Statistical Institute and funded by UNICEF in order to collect quantitative and qualitative data on this itinerant population. "Kids cannot be put into one homogeneous category," says Jain. "We need to establish different models for them in order to provide them with choices of whether they want to be sent home, kept in institutions or allowed to stay in a more open set up. The present proposal does not look at any of these things." Lawyer Anant Asthana, a member of the Juvenile Justice Board, who works closely with juvenile delinquents, is also critical of this move by the ministry of women and child development and the railway ministry. "Interventions with children in contact with the railways have to be rooted in the railways owning up responsibility towards children who are found in their jurisdiction. The present effort seems as if the ministry of women and child development has offered its help to the railways in sanitising and cleansing the railways from children. It is a 'Baccha Pakro Abhiyan' and obviously some NGOs have not negotiated for better positioning of this issue," says Asthana. "The railways," Asthana points out, "have no difficulty in renting out its spaces to profit making entities, but is not ready to spare a little space where children could feel safe and could be allowed to work from that space." "After all, the railways is not merely a profit making organisation, but is a part of the government and it is time our government needs to own up responsibility towards these kids," adds Asthana. "There is a lack of coordination in the government," says Enakshi Ganguly, who heads HAQ, a child rights NGO. "So far, the protective mechanism of taking care of these kids has rested with the ministry of social welfare. We need clarity to know whether this has been handed over to railways." "Also, we want to know what kind of rehabilitation the government has in mind for these kids," she adds. Not every one can be shoved into an institution nor do all these kids want to return to their extremely violent families. This entire scheme needs greater detailing." What has alarmed NGOs is that since this scheme was launched, children have vanished from Delhi railway stations. "The Nizamuddin East railway station presently has four to five children NGOs including Butterflies, Prayas and Chetna operating from there," says Ganguly. "New Delhi station has these and the Salaam Balack Trust. It is important that these kids do not become invisible because they will move to the old city area or Paharganj gallis where they will be subject to even more brutalisation. At least in the stations, they remain in a public domain where there is some level of monitoring." Rita Panicker, the founder of the NGO Butterflies, says her organisation runs a ChildLine booth at the Nizamuddin station in New Delhi. "We have been there for 2, 3 months. The railway personnel rescue the child and bring her/him to us. We then follow the due juvenile procedure and try and trace her/his parents or else hand her/him over to an institution," explains Panicker. The government is going ahead with these ChildLine booths despite the activists' reservations. Railway Minister Suresh Prabhu has emphasised the need to create an online database of missing and runaway children rescued at railway stations in collaboration with the ministry of women and child development. "We should have an online registration system where the rescued child's photograph and other details are uploaded online so that their families can easily track them," says Prabhu. Women and Child Development Minister Maneka Gandhi has suggested integrating the ChildLine scheme with Khoya Paya, her ministry's Web site to track missing children. Gandhi believes children's posters must be put up at all railway stations and in train bogies to advise the public to be cautious and conscious of children who may need protection. "Trains are used the most by children who are trying to flee from homes," says Gandhi. "Later, they are made to work in places like mines, at restaurants and are at times given drugs instead of a salary so that the addiction doesn't allow them to leave." "If funds permit," the minister adds, "train ticket examiners should be increased in second and third class compartments to keep a check." Twenty major railway stations have been chosen to start the scheme: New Delhi, Delhi (Main), Nizamuddin, Anand Vihar Terminus, Mumbai Central, CST Mumbai, Howrah, Sealdah, New Jalpaiguri, Ranchi, Chennai Central, Chennai Egmore, Lucknow (NR), Lucknow (NER), Guwahati, Bangalore City, Patna, Varanasi Cantonment, Secunderabad and Nagpur. Posters are expected to be put up in all coaches carrying passengers within the next six months with Gandhi requesting the railway minister to put a minimum of four posters in every bogie. All railway stations and passenger trains will have these posters in the next six months. Since the launch of the ChildLine initiative five months ago, assistance has been provided to more than 4,000 children and 1,896 cases have been produced before child welfare committees. "NGOs," says Gandhi,"rescued up to 700 children in the first month of launching this initiative in these 20 stations."